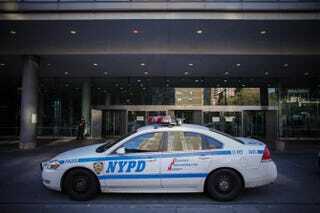 An NYPD car stands outside Bellevue Hospital Oct. 25, 2014, in New York City. Two New York City police officers are recovering after being beaten up by a group of suspects whom they were trying to arrest in the stairwell of a housing project in the borough of Brooklyn, the New York Post reports. According to the report, the cops were patrolling the housing project early Sunday morning, searching for a robbery suspect, when they came upon a group of men hanging out in the stairwell. The cops told the group to get up against the wall and were trying to handcuff them when the men turned against them and started beating up the two officers. The officers were kicked and punched repeatedly before the suspects took off. One officer is nursing head and neck injuries, while the other suffered a shoulder injury, according to the authorities, the Post notes. The injured officers managed to call for backup, and soon the four suspects were taken into custody. William Rivera Sr., 46, and his son William Rivera Jr., 26, along with Noel Gonzalez-Colon, 28, and David Rivera, 44, were all arrested. “These brave officers were set upon by a group of thugs who have seriously assaulted police officers and attempted to take their weapons in the past,” Patrolmen’s Benevolent Association President Patrick Lynch said, according to the Post.